There are many benefits to drinking rooibos tea, among those is the fact that it contains no caffeine. It is a perfect tea if you wish to avoid caffeine or are sensitive to the chemical. Possibly the best news is that rooibos tea tastes great and can be mixed into delightful tea drinks. There is no reason not to try it. However, rooibos is not decaf. The term "decaffeinated" refers to items which had caffeine, then went through a process to have most of the caffeine removed. Since rooibos is naturally caffeine-free, it cannot be decaffeinated. Making rooibos tea is not difficult though it's best to give it a long steeping time. Many fans of this tea allow the leaves to steep in hot water for 5-7 minutes. Be patient with this one as the flavor gets better with every extra minute. Like some black teas, rooibos is pleasant with milk and sugar. 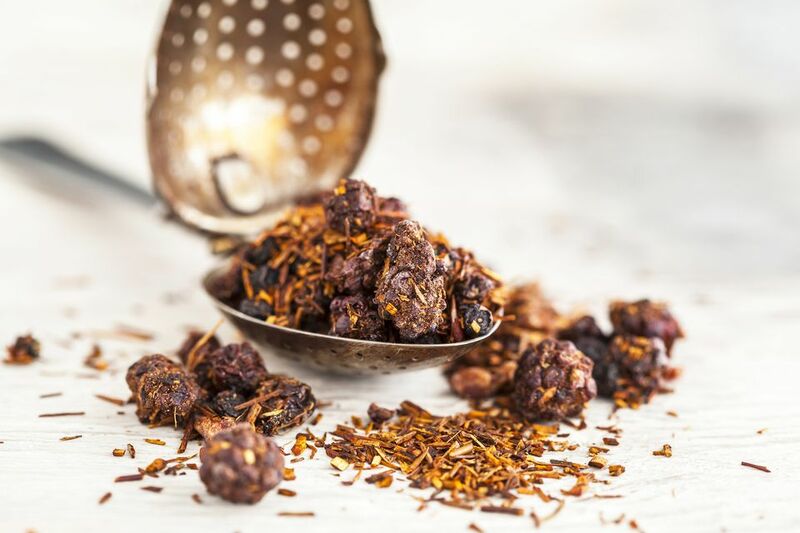 Flavored rooibos blends (such as Earl Rooibos) can be used as a replacement for flavored black teas (such as Earl Grey). Because rooibos is similar to black tea, it's also fantastic to mix into other drinks. Step beyond the basic cup of tea and try one of these recipes. Red Rooibos Chai - A fantastic, caffeine-free version of chai tea, this recipe is certainly not short on flavor. Raspberry & Rooibos Iced Tea - Skip the commercial iced teas with all their additives and mix up this delightful, easy summer drink. Thai Iced Tea - Learn how to make a cold and creamy iced tea with this authentic recipe. While any tea will do, rooibos is the ideal caffeine-free option. Borrachon Lemonade Cocktail - A true delight, this bourbon cocktail begins with a homemade lemonade of rooibos and pomegranate that is tasty on its own. Wild Turkey Sparkling Tea - Rooibos is our top recommendation for this light party punch that turns iced tea into an adults-only libation. Rooibos falls into the category of tisanes, or herbal teas. Unless you find the very rare blend that mixes rooibos with real tea leaves, you will not have to worry about caffeine. The same can be said for many other tisanes. If you have a sensitivity to caffeine, be sure to read the ingredient list on any tea you purchase. While it is accepted that tisanes contain caffeine-free herbs, the label 'herbal tea' is very common and can be used to denote blends that do contain caffeinated ingredients. Look for any indication that green tea, black tea, or any tea leaf is included in the blend. Those will be very rare instances and, in general, any tisane or true herbal tea will be caffeine free. The exception is Yerba Mate. Many tea sellers are also kind enough to state that a tea is caffeine-free (it helps them sell).